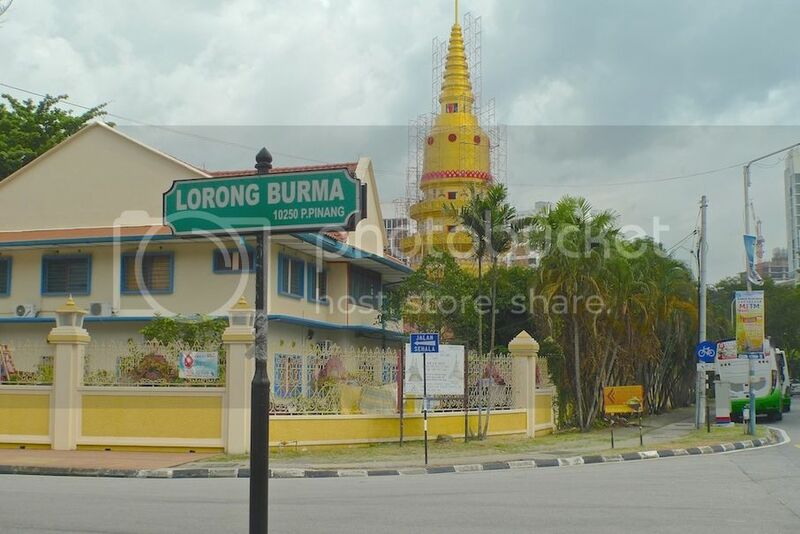 On my last day in Penang, I visited the famous Dhammikarama Burmese Buddhist Temple located along Burmah Lane (Lorong Burma). 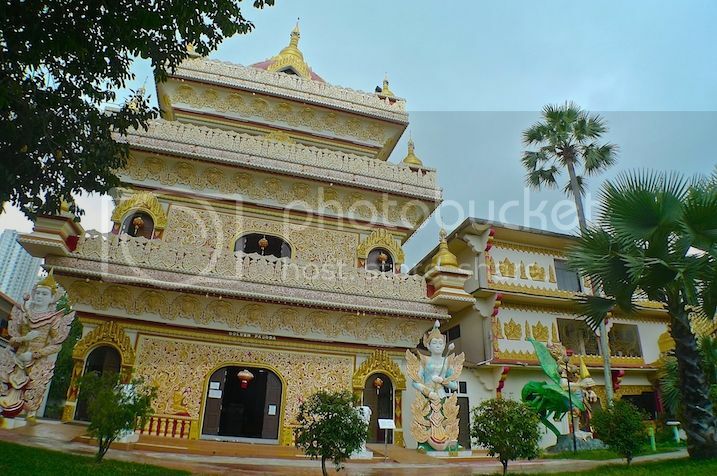 It is the only Burmese Buddhist Temple built in Malaysia and probably one of the few Burmese temples outside of Myanmar. 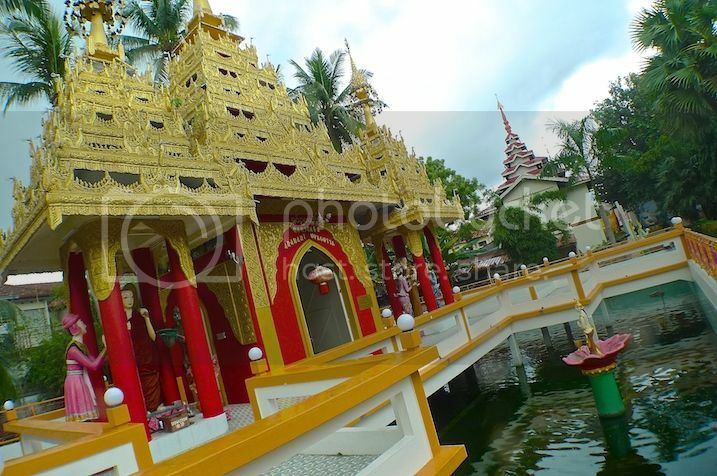 Directly opposite this Burmese Temple is the famous Thai 'Reclining Buddha' Temple (also known as Wat Chayamangkalaram) which I visited as well, and will be blogging about in the next post. 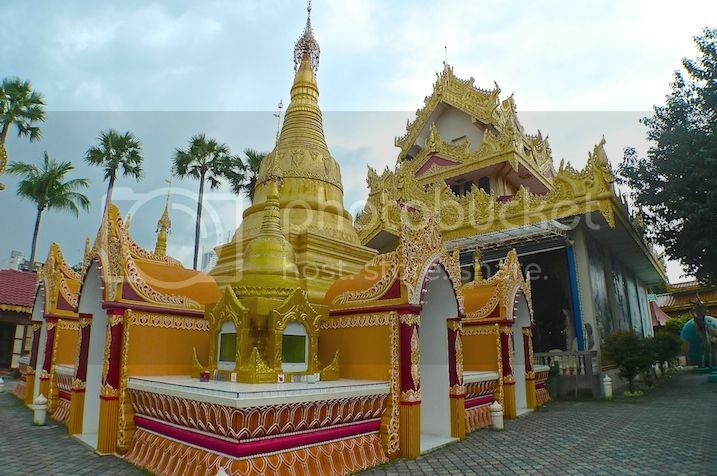 Can you see that chedi (or stupa) under construction in the photo below? 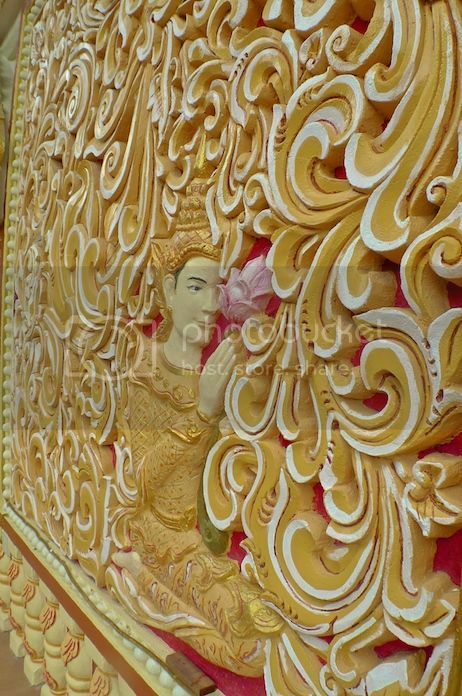 That's from the Thai Temple. 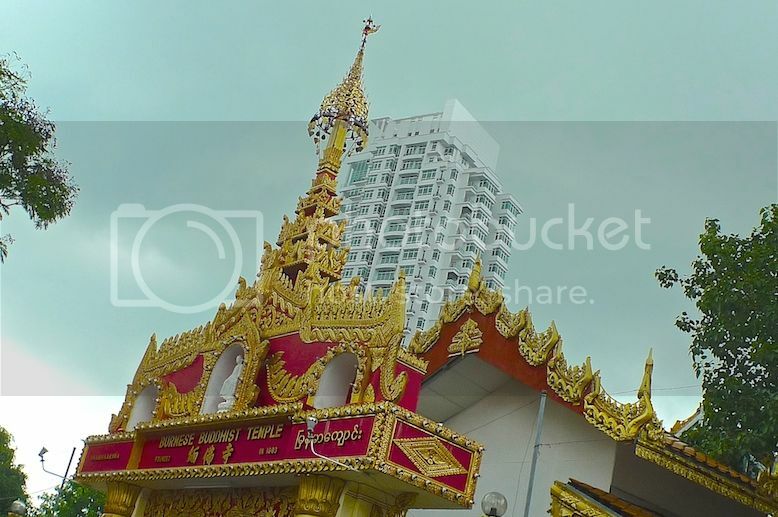 Visiting both the Burmese and Thai temples was very convenient for me as they were just within walking distance from Evergreen Laurel Hotel (at Gurney Drive) where I stayed. 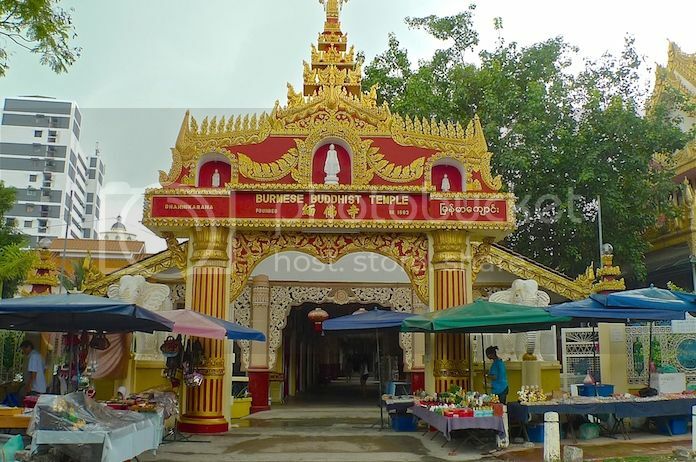 This is the red and golden entrance arch to the the Dhammikarama Burmese Buddhist Temple. 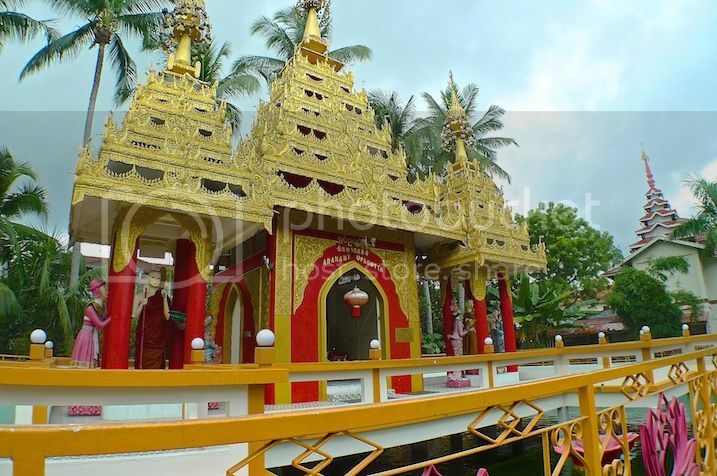 Originally known as Nandy Moloh Burmese Temple, the Dhammikarama Burmese Temple was built in 1803 on a piece of land donated by a Burmese, Nonya Betong who purchased it from one George Layton. 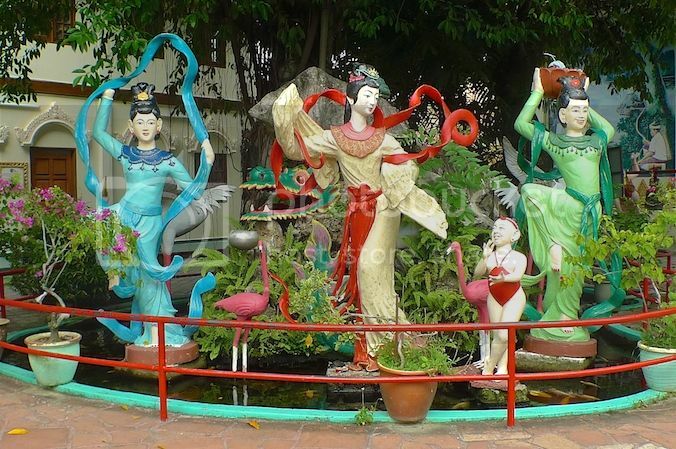 With more than 200 years of history, this temple was designated as Penang State Heritage Site during Visit Penang Year in 1998. 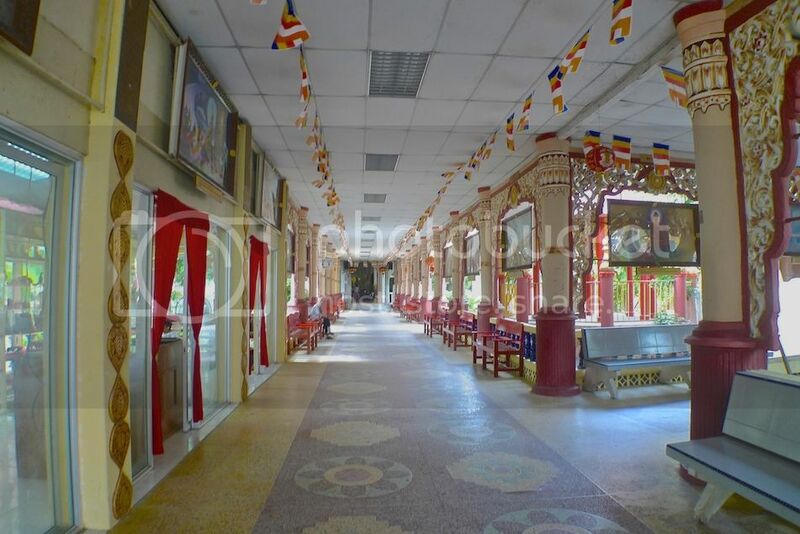 Upon walking in, there was a long, grand corridor in front of me leading to the main prayer hall. 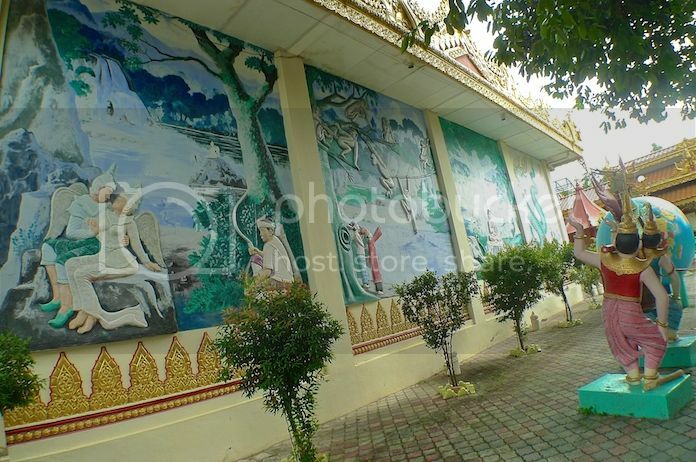 There were many paintings on the wall of the corridor telling the life story of Gautama Buddha. I took a couple of pictures. 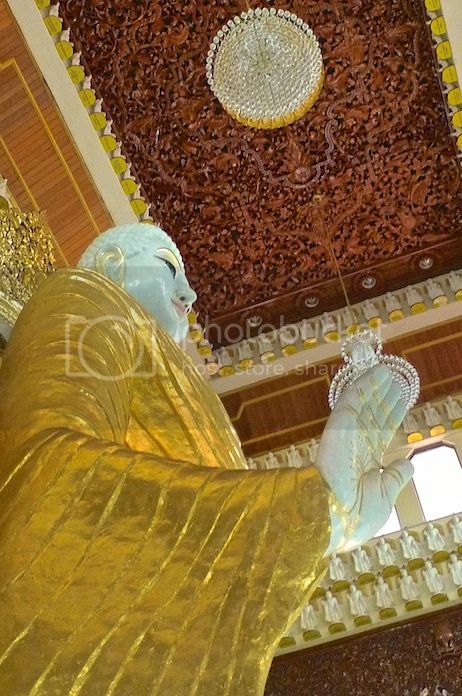 The Buddha performing the twin miracles in order to subdue the erroneous pride of his older royal relatives. 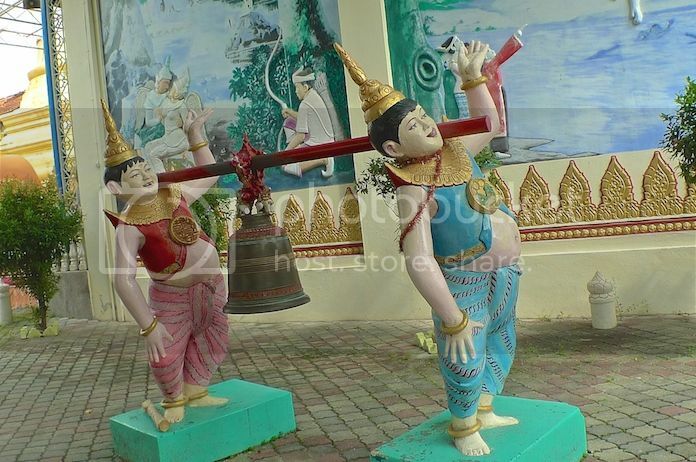 The Buddha overcoming a cruel man, Angulimala who cut off the right index finger of passing travellers. 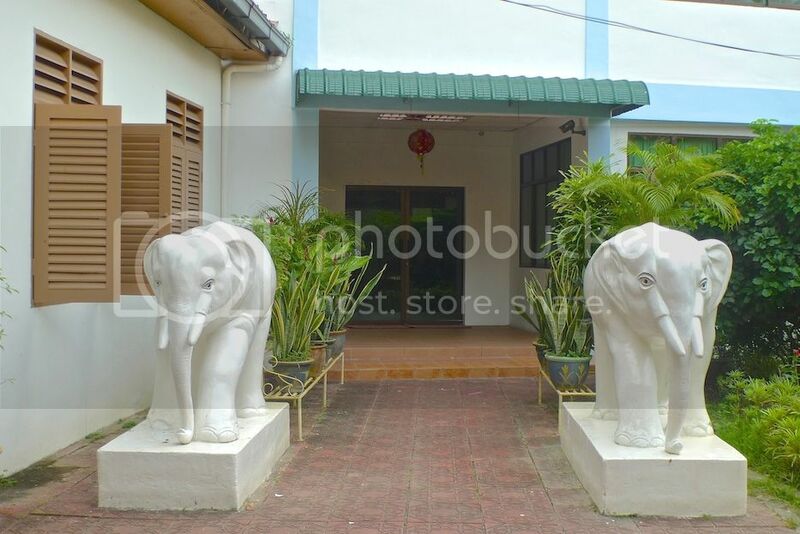 A pair of stone elephants in white guarding the entrance to another part of the temple. Inside the main prayer hall. 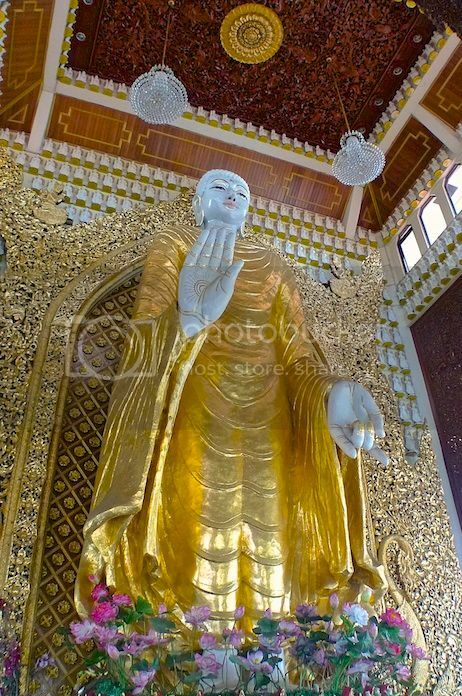 I thought the Burmese version of the Buddha looked a bit different. There is another hall on the right hand side of the temple entrance called the Sima Shrine Hall, but I did not enter that yet. Somehow, I ended up in the garden compound and saw this. Beautiful, no? Then I came across a pair of winged chimeras. 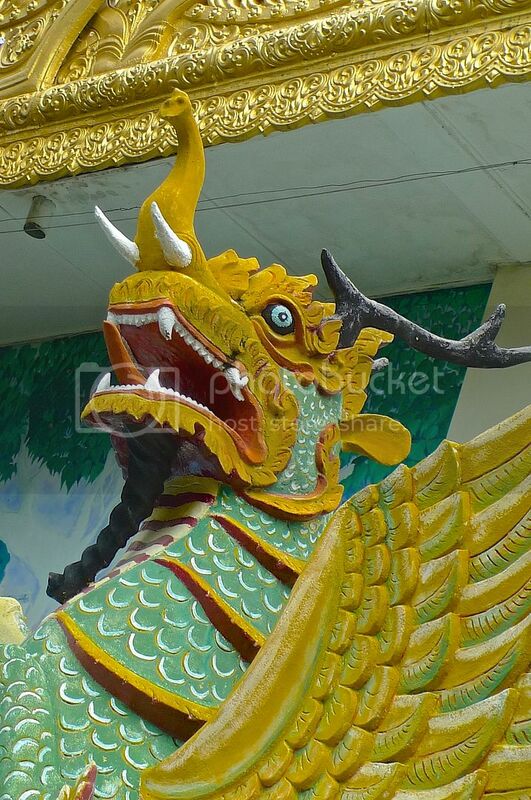 These mythical beasts which have features that belong to various animals are called Panca Rupa. 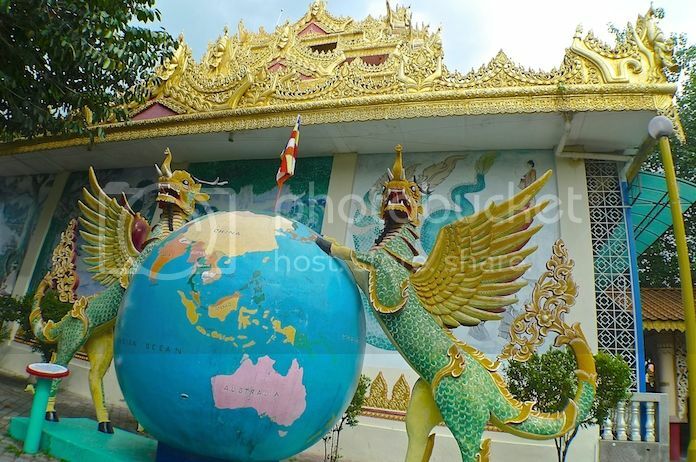 They appear to be standing over a globe which symbolises their roles as Guardian Protectors of the world. 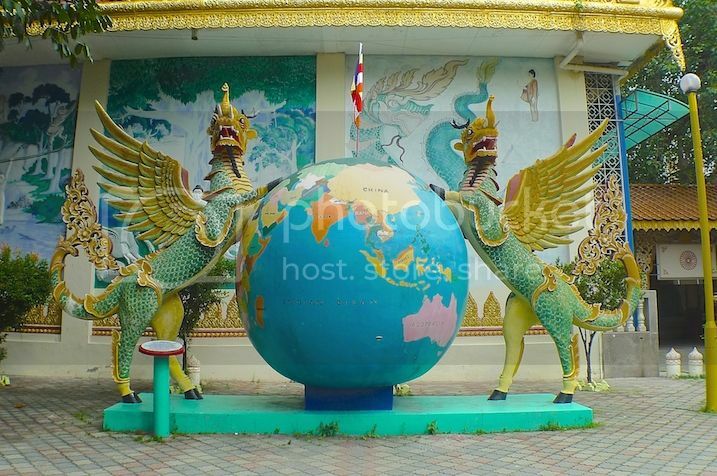 If you look carefully, you can see that these Guardian Protectors possess trunks and tusks of the elephant, hoofed legs of the horse, face of the lion, horns of the deer, body and tail of the fish and two powerful wings of the mythical giant bird, Garuda. A closer shot of the Panca Rupa. See the tusks, trunks and horns? And the fish scales on its body? 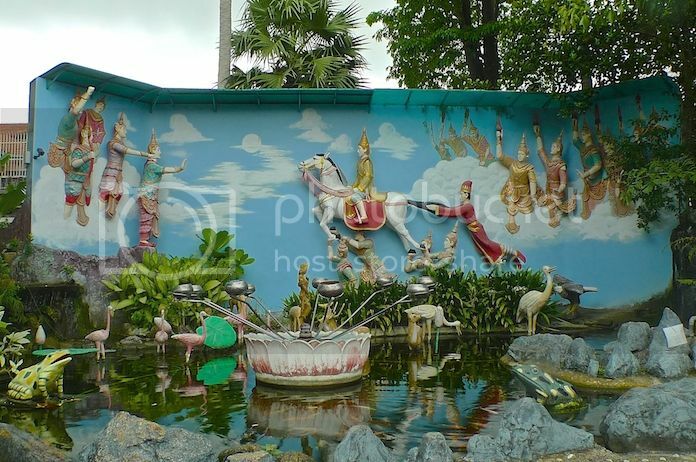 There were many other mythical figures and religions icons all around the temple compound which made this temple very interesting. 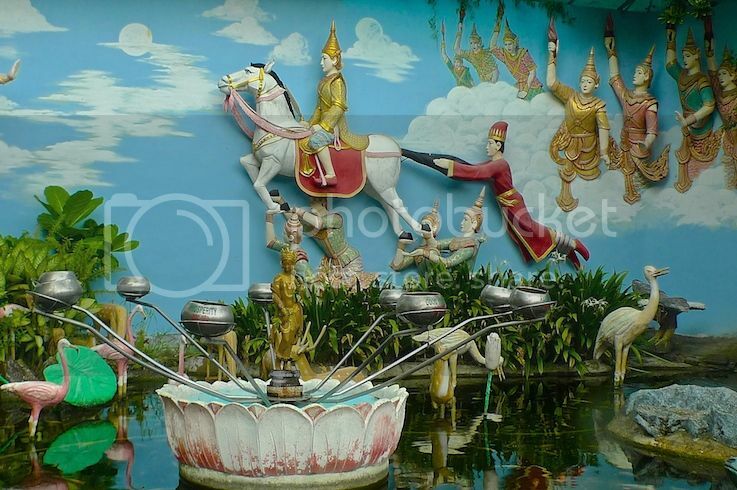 Nice 3D mural paintings on the wall. 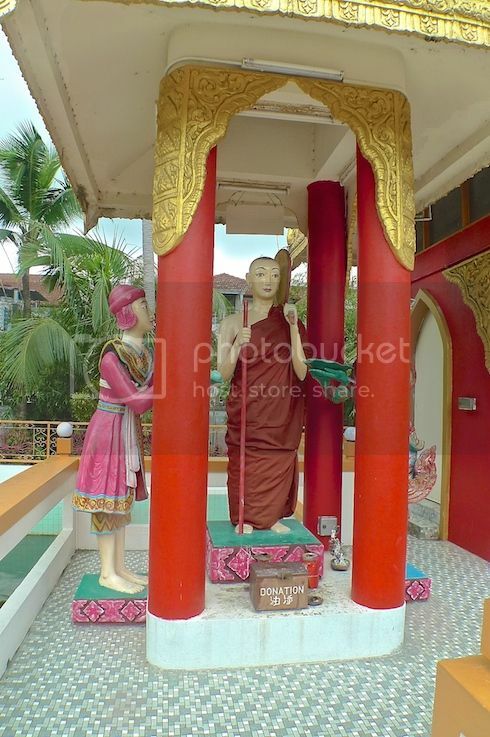 A Buddha statue housed inside the structure. 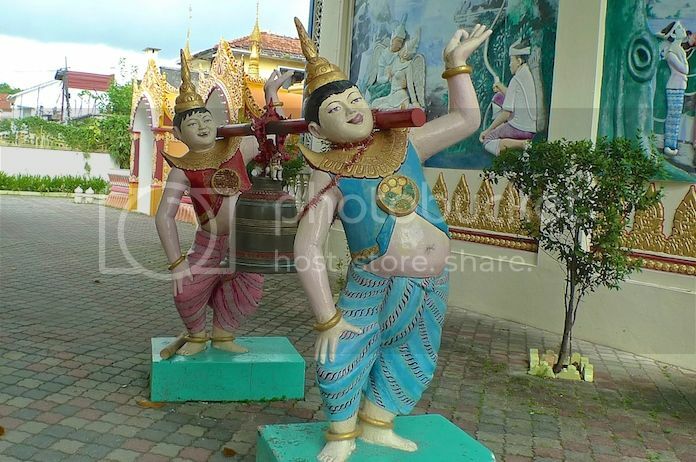 After passing the chedi, I reached the front part of the temple again where The Sima Shrine Hall is located. 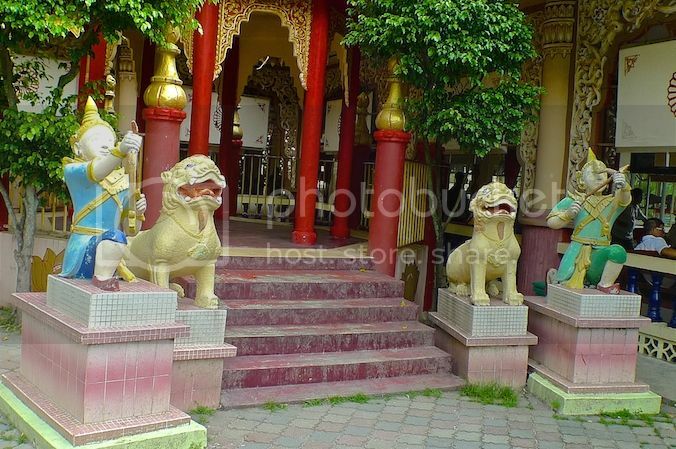 The entrance to this hall is flanked by a pair of mythical beings called chinthes. The chinthes looked like a cross between a dragon, a dog and a lion. 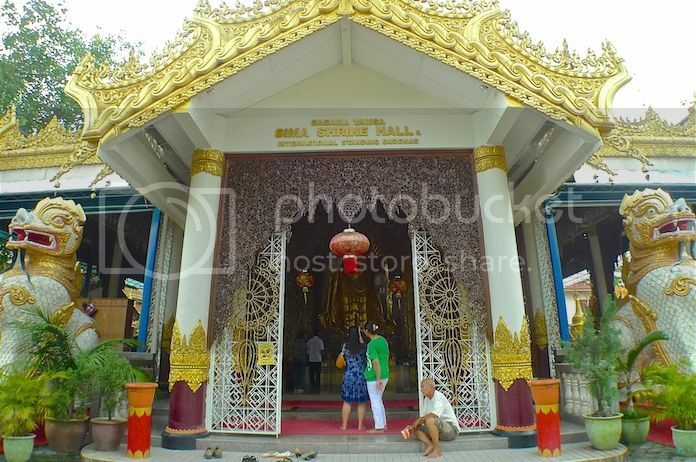 What is particularly interesting about this Sime Shrine Hall is that it houses a giant all-marble standing Buddha. 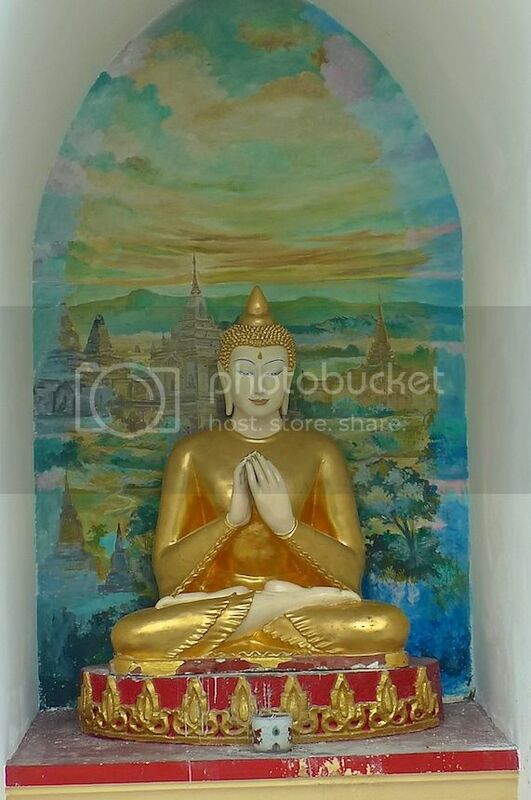 The standing Buddha greeted me as I entered the Hall. 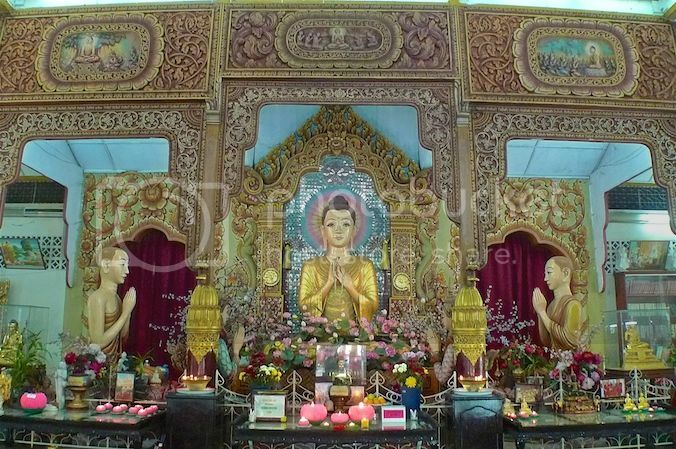 Did you notice all those smaller Buddha figurines on the wall? 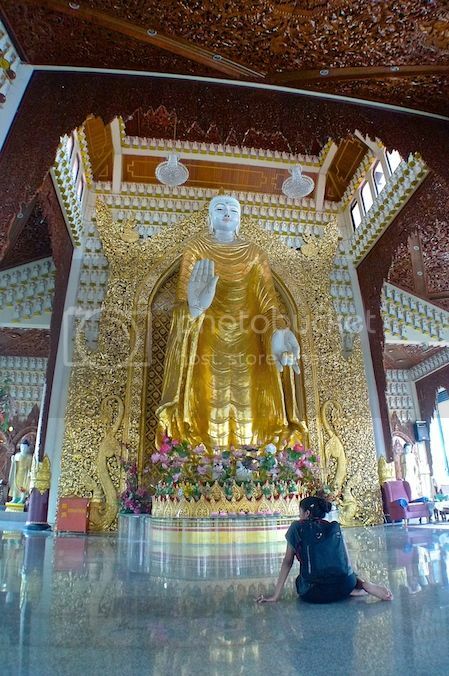 The standing Buddha statue looks grand and magnificent! The decoration inside the Hall was also very impressive. 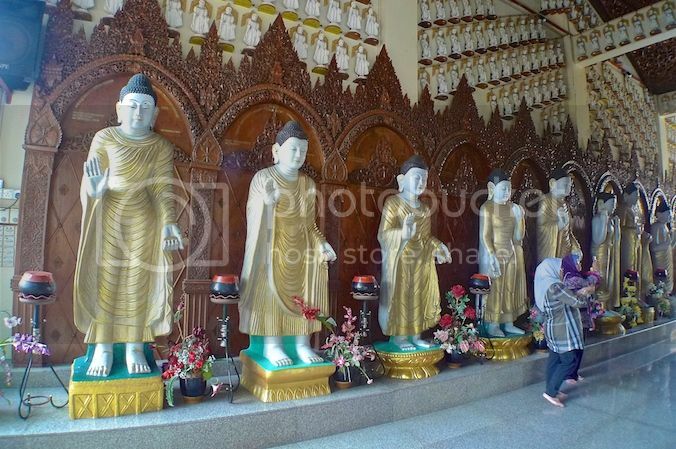 Behind the giant standing Buddha are two rows of smaller Buddha statues. 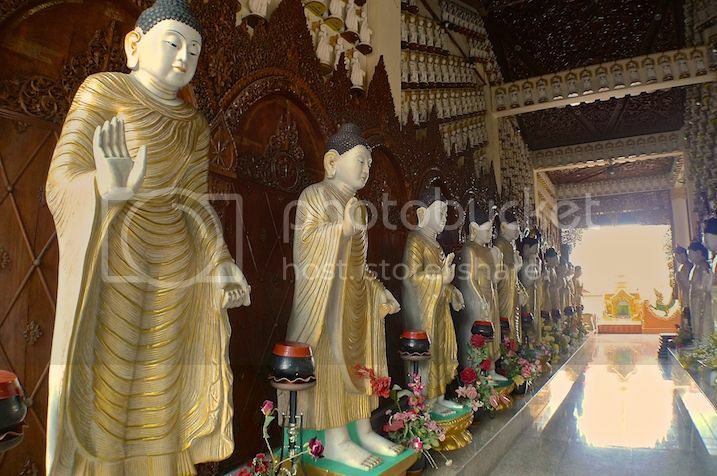 These Buddha statues are very special because each of them is actually a replica of localized Buddha images from different countries! As I left the hall and went back out into the temple compound, I saw this structure. It is the Arahant Upagutta Pavilion. 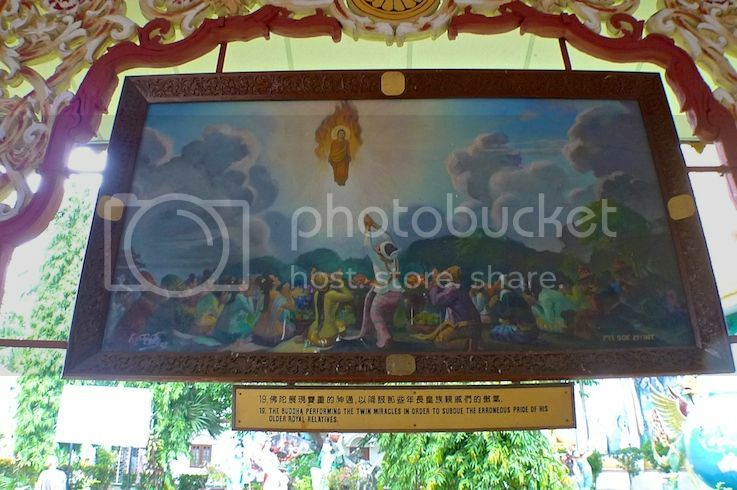 This pavilion is actually a shrine dating back to 1840 dedicated to Arahant Upagutta, a spirit believed by devotees to have power for overcoming all obstacles, fulfilling wishes and exorcising evil. 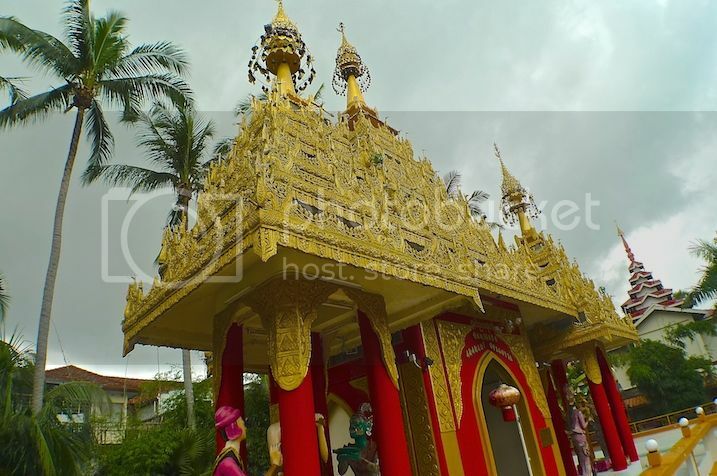 The shrine had been reconstructed a number of times, the latest being in 1976. There's a small pond surrounding the shrine. 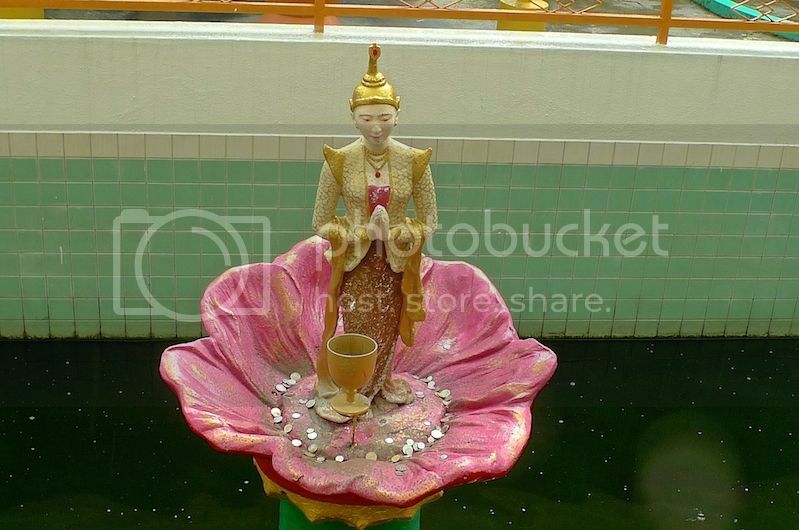 A small statue on a lotus flower on the pond. 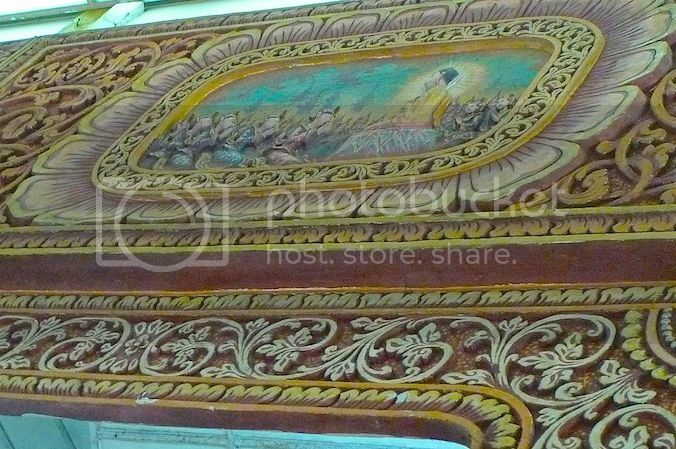 Exploring the temple compounds further, I reached this giant 3D mural depicting the Great Renunciation of Siddharta Gautama. 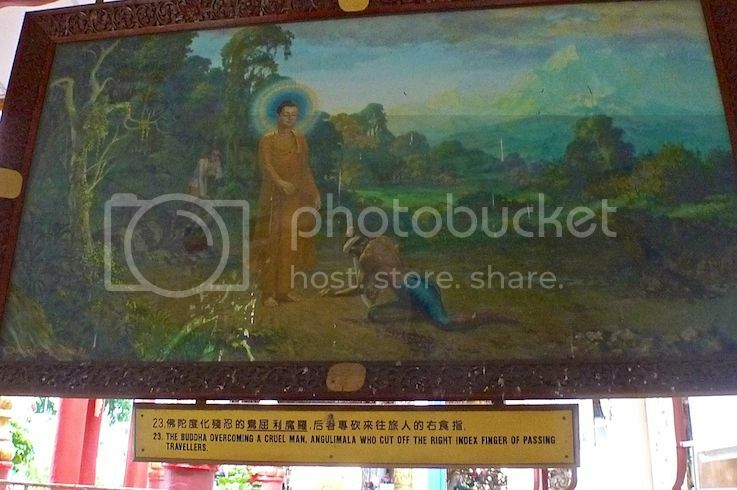 The mural shows how the Prince Siddharta Gautama renounced his worldly possession for the life of an ascetic. Riding on his stallion Kanthaka and followed by his servant Channa, the Prince crossed the river Anoma where he discarded his princely attire. On the right are Devas (heavenly beings) who encouraged him in his search for Supreme Enlightenment while on the left are Maras (evil demons) who tried to dissuade him. 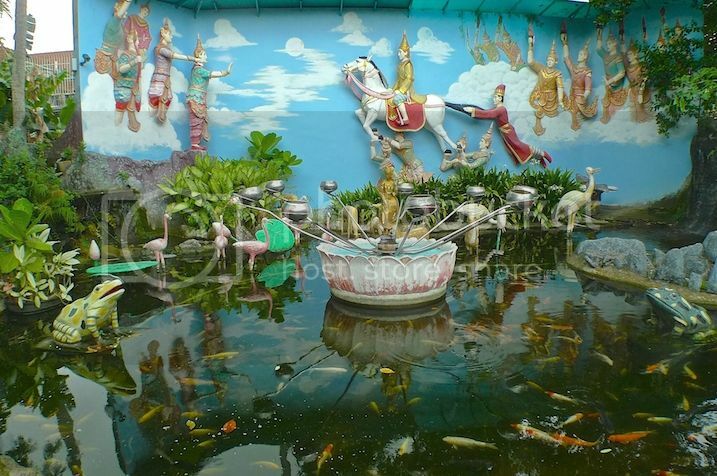 The pond in front of the mural is a wishing pond with a revolving metal bowls. Visitors can throw coins into the bowls in order for their wishes to be fulfilled. 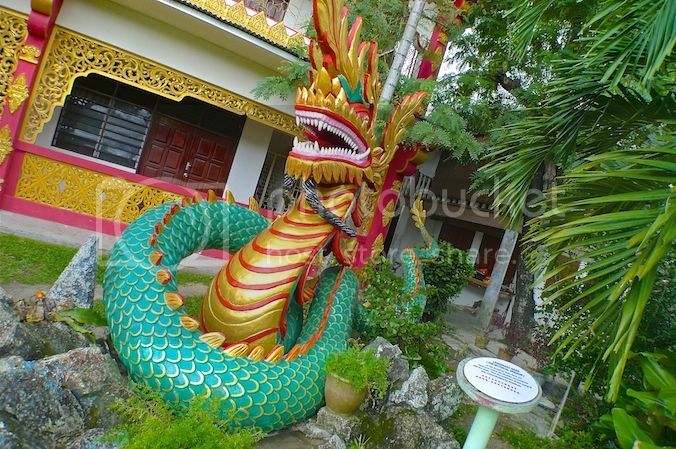 Nearby, I saw this Naga, the legendary mythical dragon. 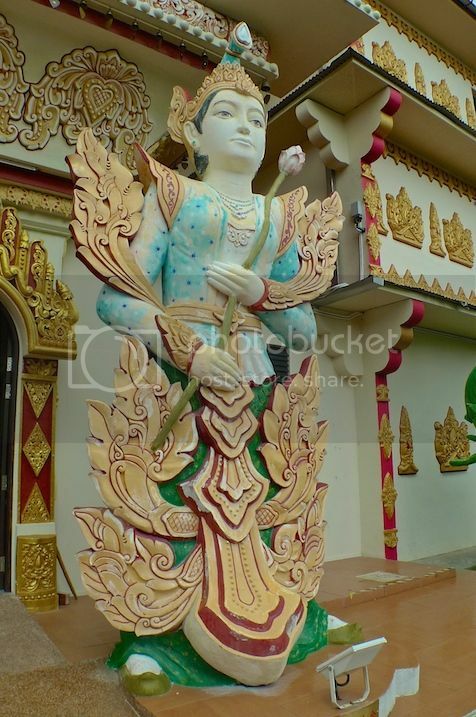 In the Buddhist text, it is said that Buddha had encountered with the Naga. 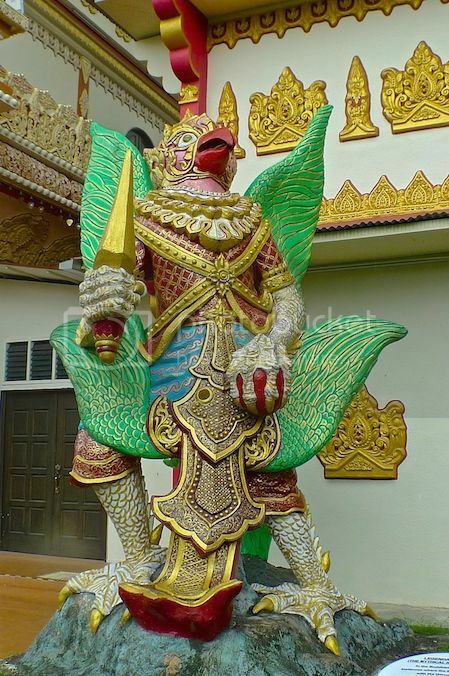 A statue of the mythical bird Garuda. 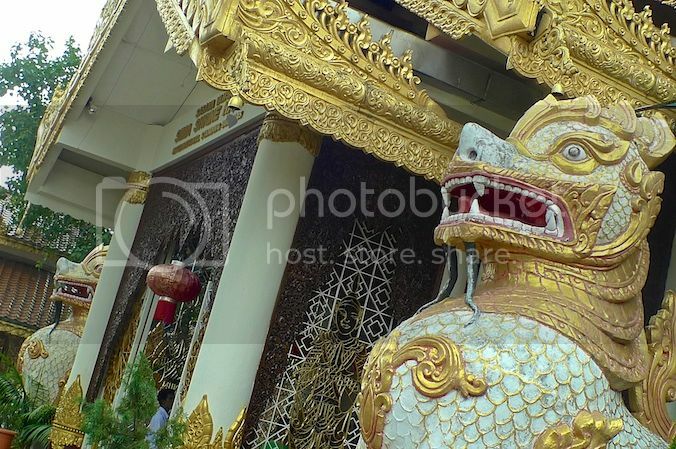 Reaching the rear end of the temple compound, I saw a four-storey building. 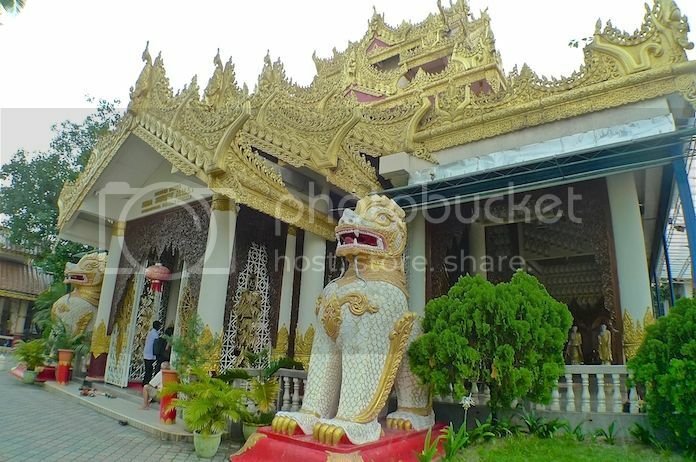 This is the Golden Pagoda Bell Tower. Housed within this Bell Tower are authentic replicas of ancient Buddhist shrines from 22 countries. Opened to the public in May 2011, it is a relatively new building. Unfortunately, I did not enter the Bell Tower as I did not know the importance of this building at that time. Also, it was already drizzling and I needed to rush back to the front part of the temple in case the rain turns heavy (no sheltered walkway from here to the Main Hall). Still, rain or no rain, I just had to take a photo of the facade wall of the Bell Tower. 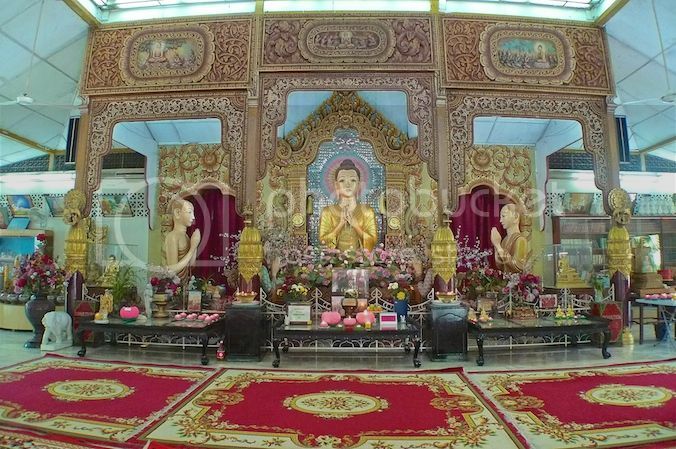 It is said that all the decorations and paintings here were done by well known artisans from Myanmar. 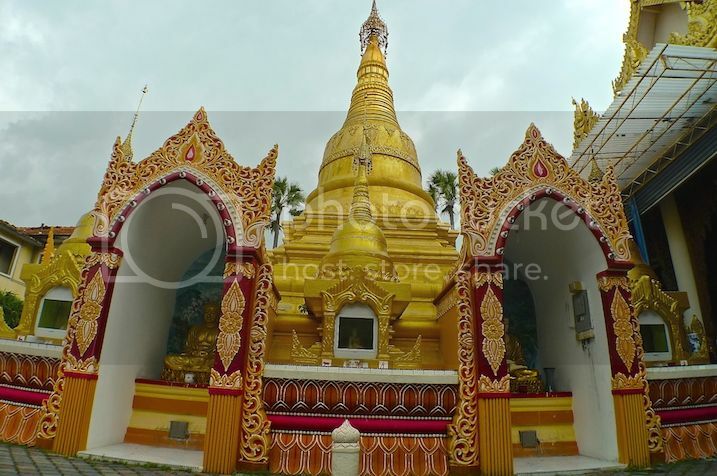 If I were to return to Penang in future, I will definitely visit this Golden Pagoda Bell Tower again and explore what's inside. 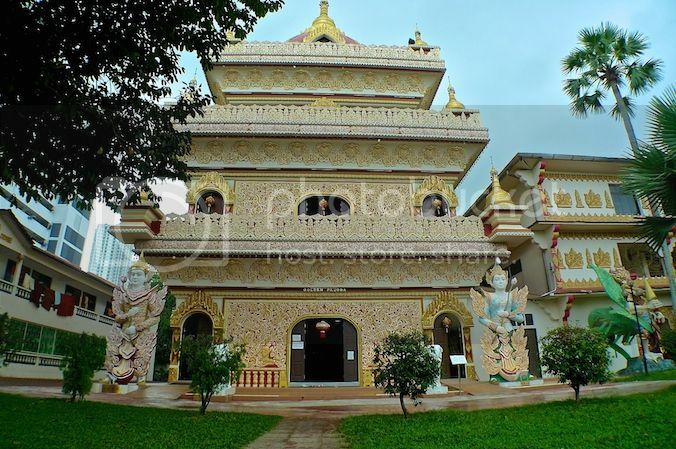 By the time I reached the front arch entrance of the Dhammikarama Burmese Buddhist Temple, the drizzle had lessened somewhat. 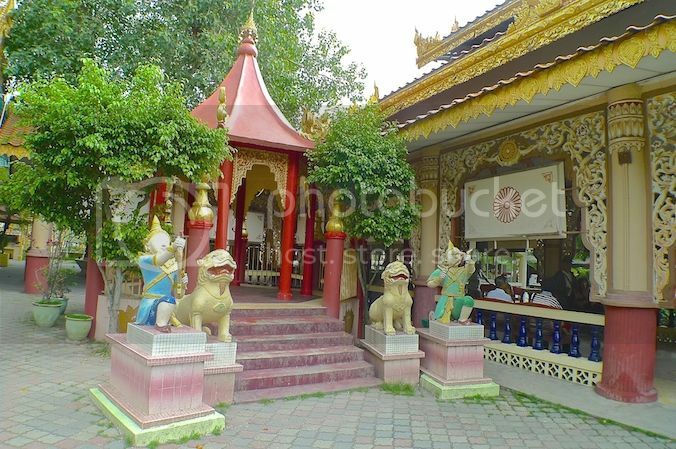 But with the overhead sky still dark, I quickly crossed the road to make my way to the Thai Buddhist Temple opposite.